It’s almost impossible to classify any travel experience as the most memorable – each journey has its own highlights, rewards, its own set of challenges and its own special story. 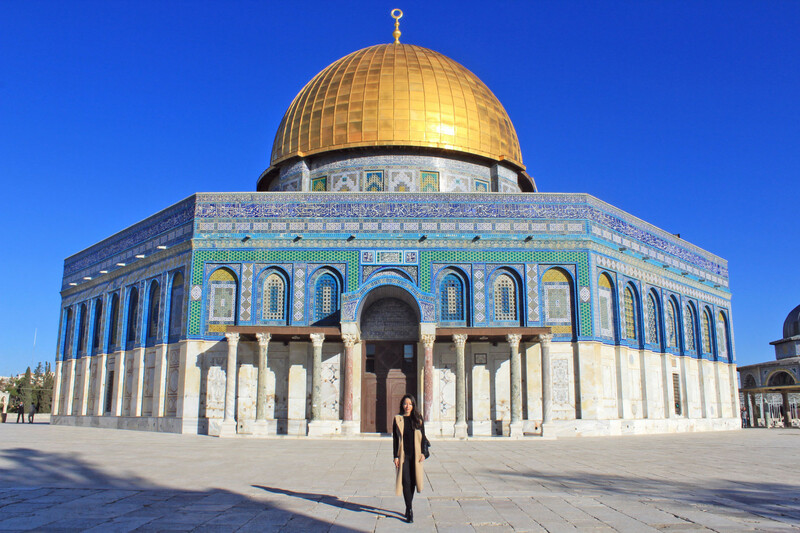 I can honestly say, however, that Jerusalem is one of the most fascinating places I have ever visited, and if it’s not already on your bucket list, it should be. Jerusalem is many things to many people, but by planning and studying ahead you can totally make the trip work for you. When you visit all the sites, take what you feel you need – just know that a piece of this extraordinary city will forever be in your heart. The Old City is divided into four quarters: the Muslim Quarter, the Jewish Quarter, the Christian Quarter and the Armenian Quarter. Four quarters corresponding to four different cultures with varying beliefs and traditions, all with a common history that ties them together, and all surrounded by the same wall dating back to ancient times. The best way to discover them all is to get lost. Literally get lost. On purpose. Let the beautiful cobbled stoned streets take you where they may and reveal Jerusalem to you while you walk — it won’t be that hard anyway. Jerusalem is built on hills, so almost no street goes straight for more than about 5 meters, and additionally, streets change names at every intersections or on a slight curve, which makes it all very confusing. But, believe me, that’s a good thing! The Kotel ha-Ma’aravi, or Western Wall, is the remnant of the 4 walls that surrounded and supported the platform on which the Second Temple formerly stood. At more than 185 feet high and 260 feet wide, it is an amazing sight to see. The ancient Jews used to bring sacrifices to the Temple, and study and prayer were conducted there as well. Unfortunately, the temple was destroyed by the Romans around 70 C.E, and since the exact location of the Holy of Holies is no longer known, Jews do not walk on Temple Mount to avoid entering the sacred area. Instead, they congregate along the last surviving wall of the temple to pray as it is the closest they can get to the Holy of Holies. Feel the energy and the spirit that is surrounding you, and be sure to take it all in. 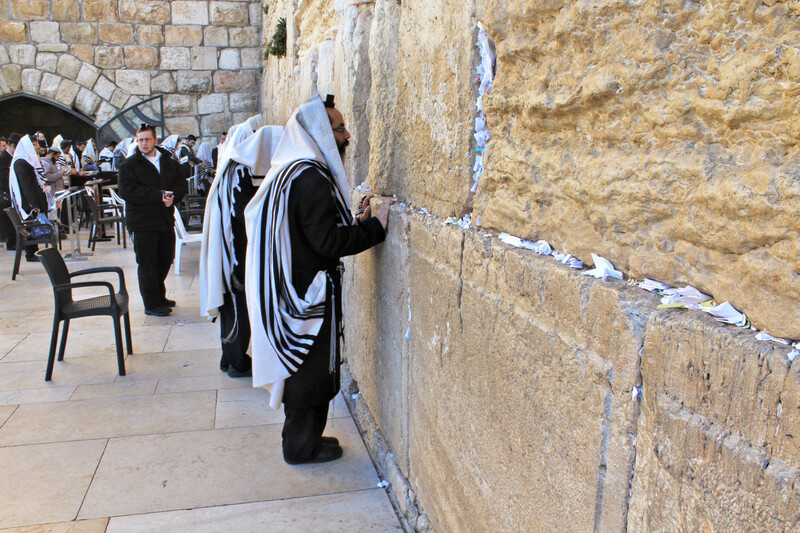 People of all religions come to pray at the wall, although only Jewish services are held publicly. It is common practice to place a note with a written prayer between the stones. Both political and religious figures have placed notes in the Wall, including Pope Paul II, and many heads of state. Each year, over a million notes are placed in the wall, and twice a year the rabbi collects them all and buries them in a dedicated area of the Mount of Olives. When you’re done, make sure to walk backwards, as it is disrespectful to turn your back to the wall. The Temple Mount is a 35 acre plaza of stone in the South East corner of Jerusalem’s Old City revered by Jews, Christians and Muslims alike. For Jews, this is the site where God gathered the dust to create Adam and where King Solomon built the First Temple of the Jews around 1000 B.C. For Muslims, the “Noble Sanctuary” is the 3rd holiest site in Islam after Mecca and Medina in Saudi Arabia. The rock under the dome is where the Prophet Muhammad left Earth to visit heaven. For Christians, the Temple Mount is significant because the temple is located where Jesus prayed daily with his disciples. It’s quite impressive how such a small area can have such an important historical and religious value for all three religions, right? 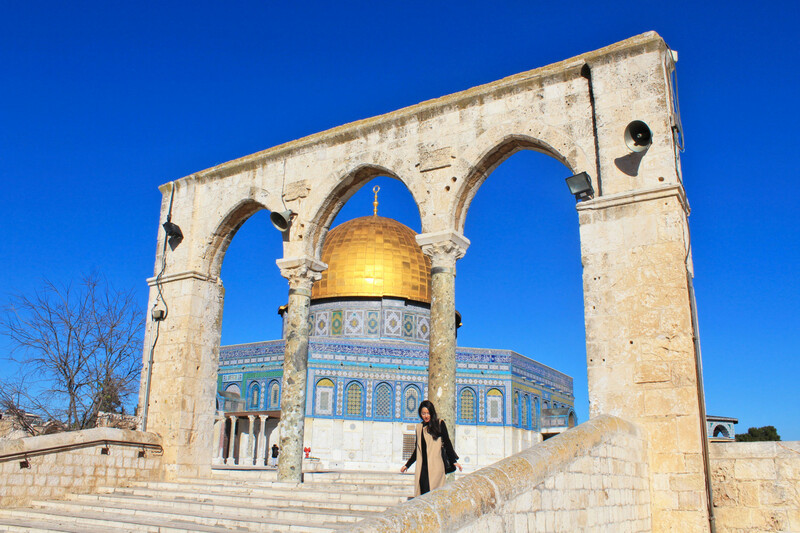 Today on the Temple Mount complex you’ll find two important Islamic structures, the Al-Aqsa Mosque and the beautiful Dome of The Rock. The entire octagonal structure of the Dome of the Rock is covered with elaborate mosaics of bright blue tiles and capped with a giant dome gilded in 80 kilograms of gold. Despite not being allowed access to the inside of the Dome of the Rock (at this point only Muslims are allowed entry), it was still incredible to be in the vicinity of such a noteworthy temple. It demands photos from every angle near or far. Closed to non-Muslims on Fridays & Saturdays. Sometimes closed due to tensions. For many Christians this Church is the most important pilgrimage destination, as the site is located on the Hill of Calvary where Jesus was believed to be crucified, and is said also to contain the place where Jesus was buried (the Sepulchre). 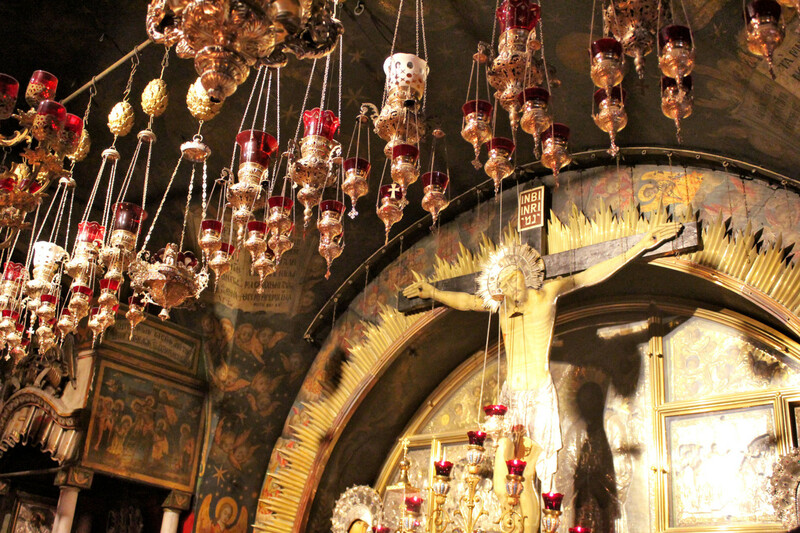 The common areas in the Church of the Holy Sepulchre are split among seven different Christian denominations: Roman Catholic, Greek Orthodox Church, Eastern Orthodox, Armenian Apostolic, Coptic Orthodox, the Ethiopian Orthodox and the Syriac Orthodox. Decades ago, the seven groups stipulated that nothing in the common areas of the church could be changed or even moved without unanimous consent of all parties involved. It should come as no surprise that the various denomination rarely agree on anything and, as a result, the building has remained unchanged for centuries. It’s a scene of fascinating chaos to see the different Christian denominations controlling different areas of the building and holding different ceremonies in them. Walking through the crush of pilgrims, observing their rituals while the scent of incense filled the air within the church was one of my greatest experiences in Jerusalem. Feeling adventurous? Spend the night there! One could easily spend a day touring the holy sites on the Mount of Olives, but be sure to visit the Church of All Nations. According to tradition, it was here that Jesus came to pray the night before his death. 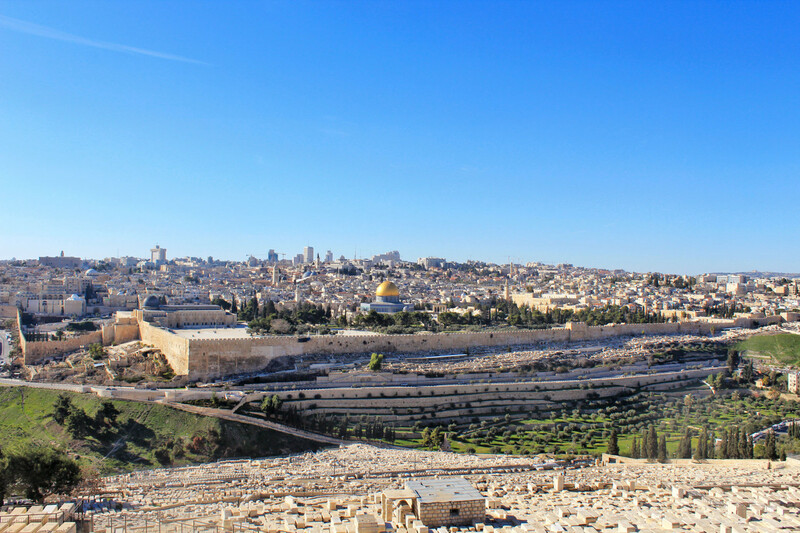 From the top of the Mount of Olives is the most panoramic view of the city, especially at dawn and dusk, when you can see by far the Dome of the Rock as it glows golden in the early morning or late afternoon sunlight. The expanse of the Old City is entirely visible, with the rest of modern Jerusalem spread out around it in every direction. 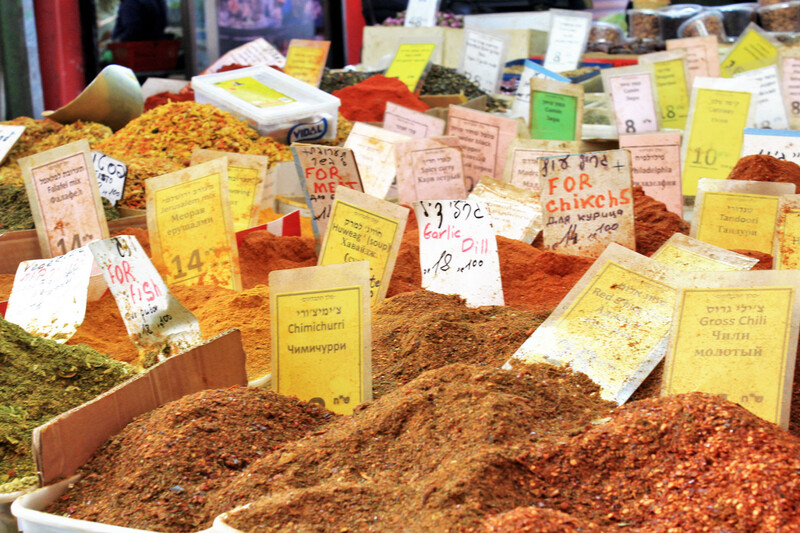 Mahane Yehuda is the name of a hip and colorful market known to everyone in Jerusalem as the shuk. It’s the perfect spot to feel Jerusalem’s ambience: the wide variety of people, the smells and tastes of different spices and foods, the delicious pastries and much much more. This is your opportunity to try some local delicacies e traditional foods from the many nationalities that make Jerusalem their home. Yes, it’s definitely a crowded market, but it’s not to be missed! 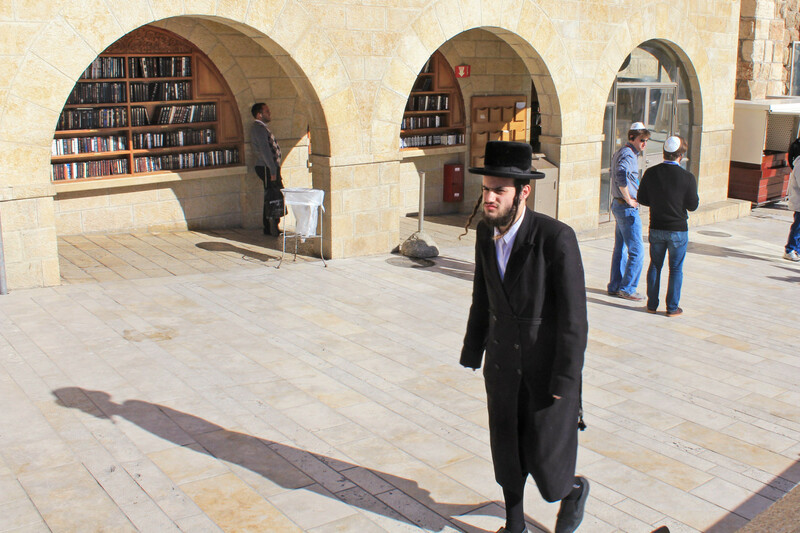 There is a wide variety of people walking around the Old City of Jerusalem, many displaying religious convictions in the way they dress or accessorize. It definitely makes for very interesting people watching, a favorite pastime for any picturesque or eclectically populated city. Talk to the locals and just observe their culture. And remember, everyone smiles in the same language. 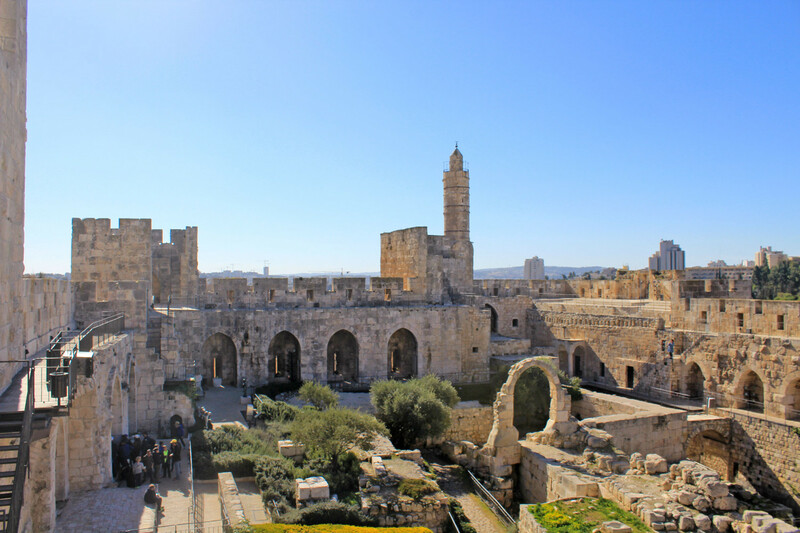 Despite its name, the citadel and its tower have nothing to do with King David and was in fact constructed in the first century BC as a fortress for King Herod the Great. Today the citadel houses a great museum of the history of Jerusalem and a nightly show which tells the history of the city through light and music. While here, make sure you climb up to the rooftop for one of Jerusalem’s best views. This museum was built in 1965, but it went through a major renovation a few years ago. It provides a great historical and archaeological background to the land now known as Israel, featuring ancient artifacts, Jewish costumes, Israeli art and many more exhibits. 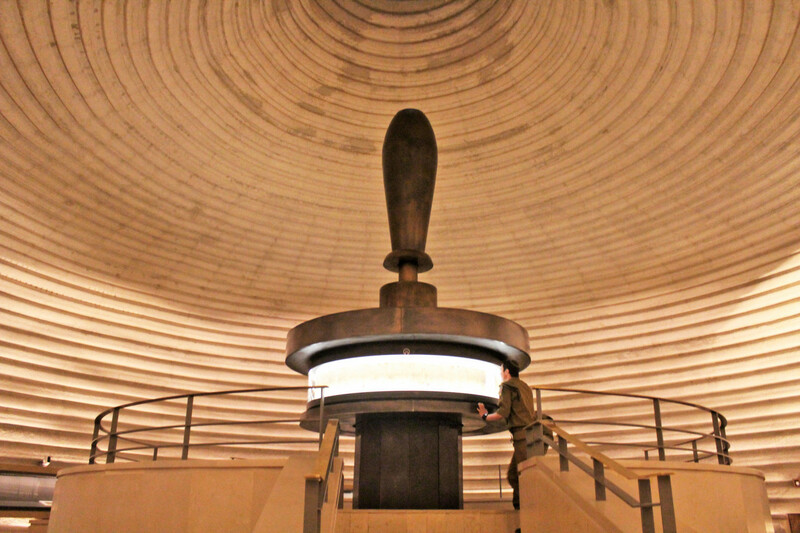 It also houses the famous Dead Sea Scrolls, the oldest biblical writings in the world. Admission: adult 50 NIS and transportation is needed to get to site. 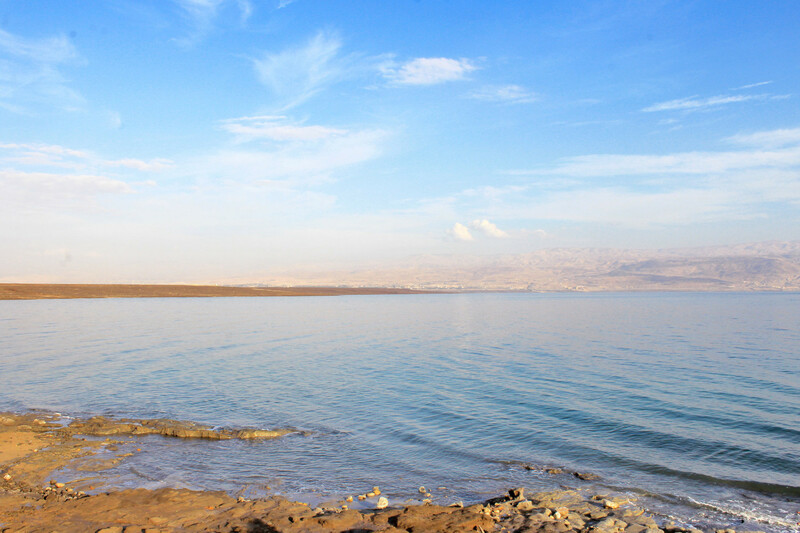 A day trip to the Dead Sea is only a short drive away from Jerusalem (39 km, 24 miles) either by car or public bus. Swimming in the Dead Sea was unquestionably one of the strangest and most interesting experiences of my life and I would definitely recommend it to pretty much anyone. For more info check this dedicated article. If you want to see all the main religious sites in one day without crowds, my recommendation is to start your day very early. 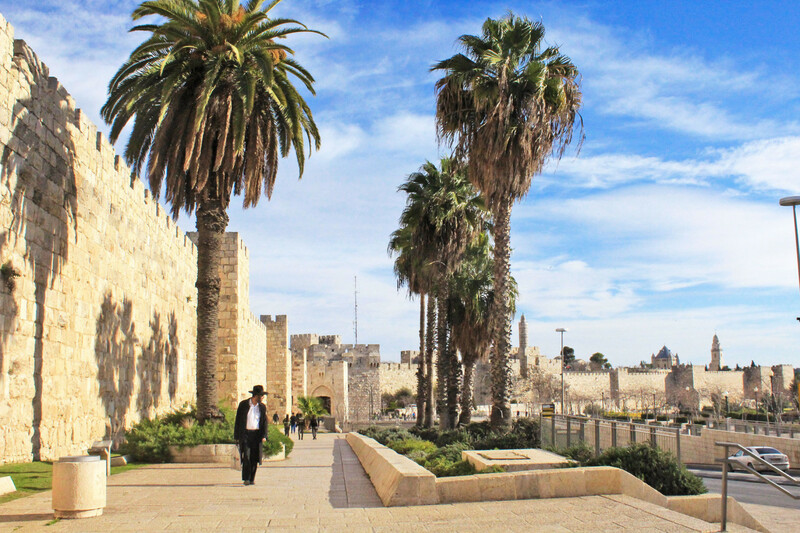 If you prefer a guided tour, check out Tourist Israel. Modest dress is important – in fact, required – at many tourist sights and in many neighborhoods. So when you go out sightseeing, make sure to dress appropriately. Don’t forget to keep your passport with at all times for security checks. Most important, come with an open heart, and an open mind. IS JERUSALEM ON YOUR TRAVEL BUCKET LIST?